The Best Meteor Shower of the Year Is Tonight. Here's How to Watch It. Meteor showers and stargazing events dot the calendar, but you should take note of this one. It's an absolute must-see. The Perseid meteor shower lasts from July 17 through August 24, but when it hits its peak on the night of Sunday, August 12, it will be one of the year's most magnificent events for stargazers. Unlike this year's Southern Delta Aquariids, things are lining up to allow the Perseids to provide an incredible show, starting the night of August 12 into the morning of August 13. The display is capable of raining down hundreds of meteors per hour. This year, Bill Cooke of NASA's Meteoroid Environment Office tells Thrillist the peak could hit as many as 100 meteors per hour, though it's more likely to be in the 60-70 range. The conditions are quite favorable for the Perseids, which can include bright fireballs. The peak arrives just after a new moon, ensuring that moonlight won't obscure your view. 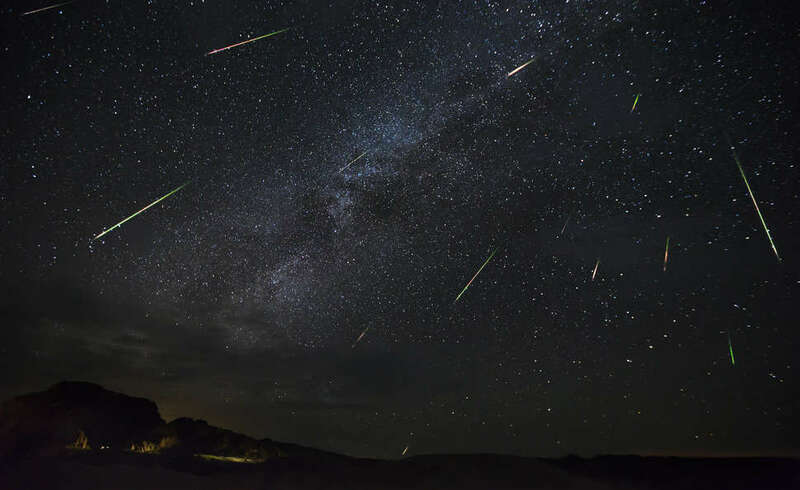 The combination of summer weather, an active storm, and favorable conditions may very well make the Perseids the best meteor shower of the year. The only more active shower will arrive in December, but you'll have to drag yourself out in to the cold in order to watch that one. When is the peak time of the Perseids meteor shower? Jane Houston Jones of NASA's Jet Propulsion Laboratory (JPL) said the shower has a "broad peak" that extends over much of the weekend, while some meteor showers peak over the course of just a few hours. The night of Sunday, August 12 (as soon as it gets dark outside) is the best time to catch the show, but that broad peak means you'll be able to see meteors between sunset and dawn on the days surrounding the peak as well. It takes the Earth three weeks "to plow through the wide trail of cometary dust from Comet Swift-Tuttle," she said. To get the best view, head toward dark skies -- away from the light pollution of the city. It takes around 30 minutes for your eyes to adjust to the darkness. Meteors should be visible to some extent right at sunset, but the most active portion of the night will come after midnight, Cooke told Space.com. That gives you plenty of time to get some snacks ready, find a meteor shower buddy, and find a good spot in the darkness to hang out and take in the stunning show. Hopefully, you'll have a clear and cloudless night in your location. (No small task in some areas with smoke obscuring the sky for many due to wildfires.) The surest way to miss out on a meteor shower is bad weather, so be sure to check your local forecast before you get too excited. Unfortunately, there's a chance that cloud cover and even wildfire smoke may spoil the experience for many people across the country, according to a forecast by AccuWeather. It looks like folks in parts of the Midwest and the Plains will have the best conditions. You'll also want to watch from somewhere with few obstructions. If there are buildings, trees, or hills in the way, they could obscure meteors from sight. With that said, don't bother with binoculars or telescopes. They'll only limit the amount of sky you'll be able to see, meaning meteors could whiz by out of your scope. If anything, laying or reclining in a wide open field is the way to go. What's the best direction to look in? Meteors during the Perseid meteor shower will appear to emanate from Perseus, its namesake constellation and radiant, which sits in the northeastern sky. However, you don't need to find the constellation to see meteors. They'll be moving away from the constellation, and with so many meteors visible, you should be able to catch some no matter where you look. Again, it's best to position yourself to see as much of the sky as possible. It will be a fun night to be out. Mars, which was at its closest approach since 2003 on July 31, will still be close. It'll appear to be a bright red dot in the sky until around 4am, per Space.com. Saturn (until 2am), Venus (9:30pm), and Jupiter (11pm) will all be visible in the night sky during the peak night for the Perseids. Getting out of town, especially if you're working Monday morning, might not be the easiest task. If that's the case and you still want to see the show, you've got options. Slooh is streaming the meteor shower live at 5pm ET. That stream will run for six hours and have live commentary. NASA also has a live webcast Sunday night, using cameras located at the Mashall Space Flight Center. The broadcast will stream live from the NASA Meteor Watch Facebook page beginning at 9pm ET and continue into the pre-dawn hours on Monday. It's not the same as being out there yourself, but it's an easy way to see a bit of what's happening if you can't make it out. Plus, seeing a bit now might tempt you into making plans in advance for the next meteor shower.